Simple, Powerful theme for bloggers. 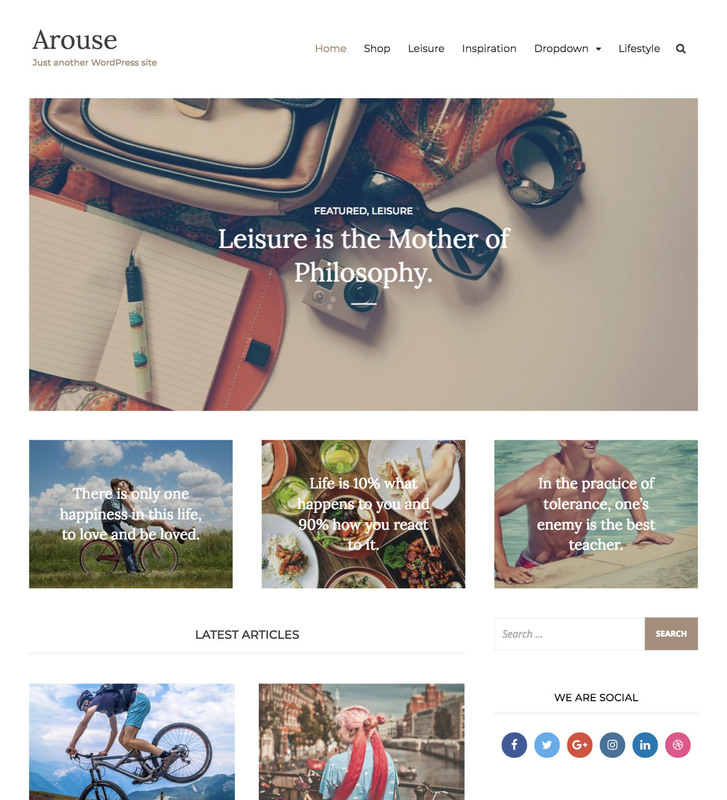 Arouse is a simple, clean and well coded WordPress theme built for bloggers. This theme can be used for any subject like Technology, Travel, Entertainment, Food and Drink, Holiday, News, etc. You can easily setup your theme from theme customizer. Built with bootstrap to display your site responsively on any type of monitors, tabs and mobile phones. Arouse WordPress theme has included a large image slider to give a nice impression of your site and display important posts highlighted. You can display latest posts or latest posts from a category. It is better to create a separate category for slider. That way you can choose what items you want to display in the slider. In the demo just below the slider you will see three boxes. You can display three latest posts or latest post posts from a category in those boxes. Also these can be used as three call out boxes for pages like About Us / Contact Us / Promotions etc. 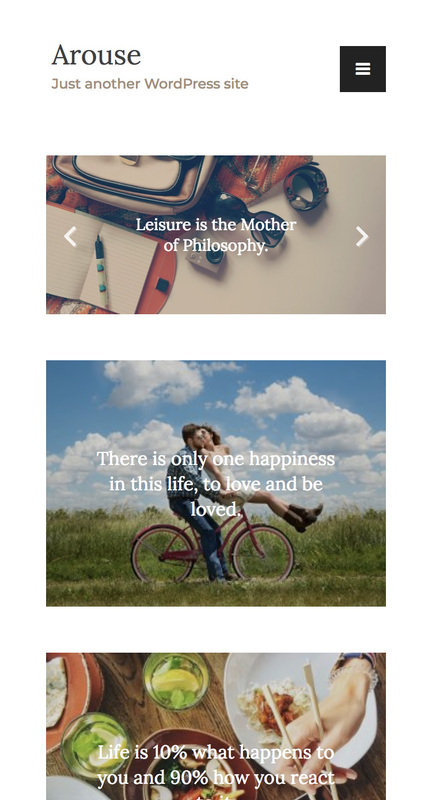 Arouse has provided two layouts to list your posts. You can choose your preferred option. You can use theme’s default sidebar posts widget to display latest posts or posts from a chosen category. And there is a social media icon widget to display social media links. There are three footer widget areas to display any kind of widgets you like. Around 75% of the users will launch to internet via mobiles in 2017 according to sources. So you should make sure your site display properly in mobiles. Arouse WordPress theme is built with bootstrap framework. So no matter what is your reader’s reading screen size, your site will display nicely. Our number one responsibility is to provide secure, reliable and fast themes for users. Our themes including Arouse has built with latest coding standards. That is why our themes have been listed in WordPress.org. You can easily do tasks like logo upload, change background color/image, change post listing layouts, add custom css, setting home page slider and featured posts just from the customizer without touching a line of code. Arouse Pro has included many more very useful features. * Fixed some styling issues in 404.php file. * Removed theme-info.php, admin.css files and related functions. * escaped custom styles output in arouse_custom_styles() function. * Fixed escaping issue in arouse_custom_styles function. * Modified arouse_excerpt_length() and arouse_excerpt_more() functions. * Fixed widget title issues. * Removed home.php and added front-page.php file to display custom sections. * Fixed an issue in slider. * Changed a sanitization method category-posts-widget.php. * Changed sanitization methods in social-links-widget.php. * Fixed a issue in featured section. * Added slider page template.